Yuengling is not exactly a brewery known for taking big, crazy risks in terms of launching new products. As America’s oldest operating brewery, as well as the largest American-owned brewery (and craft brewery) in the country, despite being sold in only a third of the states where you can find a Samuel Adams Boston Lager, Yuengling’s role tends to be that of a calming, steady hand. Their classic products such as Yuengling Traditional Lager, Yuengling Porter or Yuengling Black & Tan are marked by their immutability—the tides go in and out in the industry, but those beers stay the same. What does that actually mean consumers should expect? Well, it’s difficult to imagine that a pilsner from Yuengling will really pop with big noble hop flavors as you get from many craft brewers making the style these days. We’re not exactly expecting something that can stand up to luminaries in German beer styles such as Urban Chestnut in St. Louis or Austin Beer Garden Brewing in Austin, TX. But if the price point is similar to other core Yuengling beers, the new Golden Pilsner will hardly be competing against those premium products anyway. If we’re lucky, what you might get here is a refreshing, drinkable beer that is recognizable as pils … and at a dirt cheap price. We’ll see soon enough, as the beer will be hitting store shelves on April 1 in six markets: central Pennsylvania, Virginia Beach, Cleveland, Ohio, Rhode Island, Georgia and select markets in Tampa and Orlando. This is all assuming we’re not dealing with a particularly mean April Fool’s joke, of course. 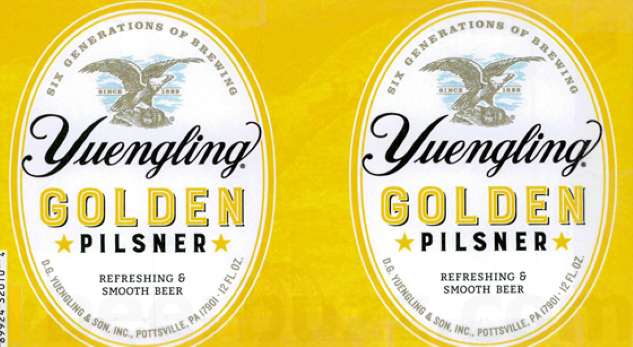 After that introduction, Yuengling Golden pilsner will be available in May “in more locations,” with a full roll-out waiting until December.